Master bathrooms can be an escape from the busyness of everyday life. After a long, hard day of work, there is nothing quite like a relaxing bath to help you unwind. If you are looking for ways to create this calming oasis, we have nine ideas to help you improve your master bathroom. Let’s take a look! Set the tone for elegance and luxury with a sparkling chandelier in your bathroom. A chandelier radiates class and beauty while adding to the room’s overall decor. If a chandelier is not within your budget, try to make all of your light fixtures match. It is a simple and less expensive way to add luxury without breaking the bank. There is no doubt that tile can transform an entire space. Adding beautiful tile to your master bathroom can transform it into a luxurious retreat. If it is within your budget, consider adding heated tile floors. Imagine the indulging warmth your feet will feel as they step out of the bathtub. Plants can bring life and beauty to any space. Be sure to buy some fresh flowers and plants to place around your master bathroom for a chic look. When you are selecting your fixtures for the bathroom, look for delicate designs. Swirls and curved handles can add a touch of simple elegance to your space while being decorative enough to add style. Instead of using wallpaper, consider adding a rich, deep color to your bathroom walls. Navy blue or plum purple are colors of elegance and royalty. A master bathroom with these colors takes charge and allows the homeowner to get creative. While choosing a color scheme, be sure that all of your colors are harmonious with one another. Limit yourself to three colors during the design process. Also, make sure that one of the three colors is a neutral tone. If you are looking for extra elegance, you may want to consider doing your entire bathroom in black and white. Having extra storage in your bathroom can instantly improve its functionality and usefulness. Try hanging a cabinet above your toilet to store your toiletries for optimal storage. Plus, try and keep your countertops clean for a well-kept look. Claw-foot tubs and antique mirrors can be the finishing touch that your master bathroom has always needed. Search vintage thrift shops and discover unique finds that you can use in your master bath. Maximize on your bathroom’s relaxation by adding spa-like features into the space. Dim lighting, candles, and relaxing music can be just what your bathroom always needed. What are your thoughts? How do you feel about these upgrades for your bathroom? Let us know below in the comment section. You can create your very own steam room within your shower. Steam generators can be expensive; however, there is a way to make your very own steam shower. First, you will want to have the shower glass installed all the way to the ceiling. There needs to be a vent in the ceiling above the shower, which can be opened and closed. When the vent is closed, the steam will accumulate and create the effects of a steam room. When the vent is opened, you can create a normal showering experience. To go even further with the spa experience, we recommend adding a shower bench. It will give you a place to sit down and soak up the steam. When selecting the fixtures for the shower, consider a nice, big rain showerhead. It will provide more water for a more enjoyable shower and rinse. If you really want a spa-like feel, you may want to install body spray jets in the ceiling or walls of the shower. Heated floors are a luxurious feature that will really make your bathroom feel like a spa. A feature like this is especially appropriate in colder climates. No matter where you live it is always nice to get out of the shower or bath and step on a beautiful, warm floor. A heated towel rod is perfect for an in-home spa. It warms your towel while you are in the shower, and let’s be honest; there is nothing better than having a warm towel to wrap yourself in after bathing. Making these select upgrades will genuinely transform a regular bathroom into a spa-like sanctuary. Which upgrade was your favorite? We would love to hear your thoughts below in the comment section. Mirror, Mirror Not ONLY on The Wall. Mirrors are great for creating the illusion of a bigger space, but consider where else you can place your mirrors. Mirrors can be used as coasters, trays, decorative pieces on shelves, etc. Mirrors have the potential to transform a space and you typically already own them. If you are not getting the use out of a mirror you already own, consider the various ways you can repurpose it. You may be pleasantly surprised by its addition to your bathroom decor. Borrow Your Bottles. Bottles can be repurposed into stylish storage containers for your bathroom. Anytime you use a bottle, jar or glass container think about how it can be repurposed to hold items in your bathroom. You can use these containers to store your floss, q-tips, cotton swabs, and toothbrushes. Live in Color. Plants bring life and color into any space. Add some flowers to your bathroom to help brighten up the room. Incorporating this pop of color in any of your decor pieces can make your space fresh and bright. Just be sure to keep your plants watered for maximum beauty. Do Not Be Basic. Anyone can decorate a bathroom to be simple, but that does not necessarily express your sense of style to your guests. Let your ideas flow and elaborate on what you have envisioned for the space. Bathrooms are great spaces to try out interesting paint colors, textures, colors, and even fabrics. Picture Perfect. Pictures never go out of style. Frame some photos from your most recent vacation or go outside and take pictures of some flowers or the landscaping. Get artsy with your phone and snap some decorative pictures for your bathroom walls. This simple hack is inexpensive and unique to your space. Keep The Classics. Do you own any furniture that is just collecting dust in your basement? Try revamping it and using it in your bathroom. Add a fresh coat of paint or remove the doors off of an old cabinet. There are endless possibilities with recycling old furniture, and the bathroom is the perfect place to incorporate them. We truly hope you have fun with these simple decorating tips. The best part is that they are easy and budget-friendly. If you end up not liking something, it is quick and simple to change it. For more expert advice, visit us at From The Floors Up. Thanks for reading! Homeowners dream of having a relaxing, elegant bathroom but sometimes, they do not know how to make it happen. We look through magazines and think about how much we would love to own those bathrooms, but we never make it a reality. Stop spending your time dreaming and have your imaginations come to life with these simple tips. Lay It All Out. Comfort, convenience, and capability can determine the layout of your bathroom. A huge factor to consider is the bathroom’s plumbing. The plumbing affects where the shower, toilet, and bathtub will sit. For help with envisioning, call your contractor to come over and walk through the room with you. They can be helpful by letting you know what is possible. Also, think about the space’s convenience. If you are shorter, your height can affect your decision on how high up the cabinets are placed. Take into consideration how convenient you want everything to be before you begin the remodel. Make It Stylish. You will need to decide on a central theme for your bathroom. You can make it simple, classy, bold, etc. Choosing your bathroom’s motif is imperative before you move forward with choosing fixtures, lighting, etc. Add Little Pleasures. Remember that this is your dream bathroom! Include luxuries that you have always dreamed about having (for example, a towel warmer or maybe jacuzzi bathtub). Light It Up. 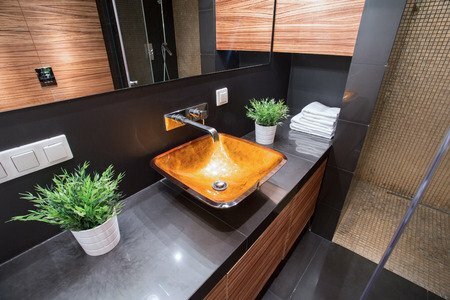 Lighting in bathrooms is more imperative than homeowners may realize. To keep the ambiance luxurious, choose warm colored light bulbs rather than fluorescence lighting. Consider the windows, mirrors, and wall color when you are deciding on the lighting for the room. Make a Statement. This space is yours to make a bold statement. Take a chance with dramatic, beautiful features to capture the essence of the room. Cozy Up. 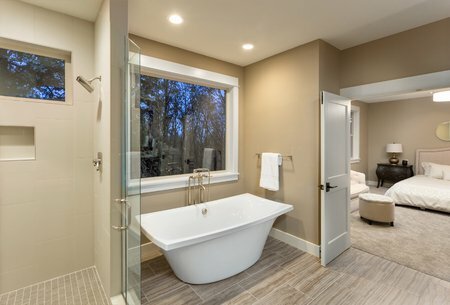 The final step in creating the perfect master bathroom is to make the space relaxing. Your bathroom can quickly turn into a spa with the right candles, bubble bath, and music. Sit back and soak up your new bathroom because you have deserved it. With the right additions, your master bathroom can turn into a dream oasis. For more expert design tips and tricks, be sure to check back weekly. Thanks for reading! In the housing market, bathrooms are considered one of the buyer’s top priorities. 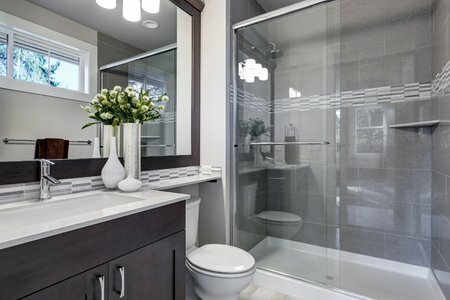 Even if you are not selling, bathrooms are an essential part of the home. To help with renovation basics, we have created a simple guide with expert tips. Let’s get started! Built-ins were definitely a trend of the past but they are making their way back into the remodeling game. Built-in’s can be considered a huge bonus in bathrooms because of their extra storage. If you renovating your bathroom, ask your contractor if it would be wise to add some built-in units. From extra shelving to a medicine cabinet, built-in units can be a total game changer. Before the renovation, you want to take a look at all other the color palette options. We recommend keeping the palette light to create a relaxing, breezy feel. For bathroom remodels, you will ideally want to set the tone with color. Lighter colors will help to keep the space tranquil and stress-free. Lighting can be one of the most important and commonly overlooked aspects of a bathroom. Be sure that you add the proper amount of lighting inside of the bathroom. You want to be able to see during a morning shave or while putting on makeup. That being said, we recommend that you also add a dimming effect. This can help set the tone of relaxation after a long, stressful day. If your fixtures are outdated, it is time for an upgrade. Sleek fixtures can help tie together an entire room; therefore, you want to be sure that you swap out your old ones. Struggling to find space in your bathroom can be frustrating. Be sure to add extra storage, hooks, and bars to your bathroom to avoid any unwanted frustration. Mirrors are not solely for looking at yourself. They also add a design aspect to the entire room. Since the mirror itself can cost a lot of money, use your current mirror and replace the frame around it. This will help save money within your budget while updating your out-dated items. We believe flooring can be an important aspect in a bathroom. From added luxury with heated floors to a breath-taking backsplash with gorgeous tiles, your bathroom can be completely transformed with the perfect flooring. Be sure to check back weekly for more home advice. Bathroom decor can easily be overlooked. With a lot of our focus being on other rooms, we may throw together a mediocre design for the bathroom and call it a day. But with a little planning and love, your bathroom can be fully designed and decorated to make you proud. Plus, with our top eight tops, you can stick to a budget and have the bathroom of your dreams. Keep reading to find out how. Bathrooms are simple by nature. Their color scheme can follow the same guidelines. Be sure to keep it simple when it comes to colors. Soft neutrals can help set the tone while not taking away from the rest of the space. But if you are looking to add colorful walls, we recommend pairing it with only neutrals like black or white to help balance out the space. For example, if your heart is set on a deep blue, you may find it helpful to pair it with black and white. These colors will add to the color scheme without demanding too much attention. Plus, you can accent it further with something like gold fixtures. A simple way to add detail without breaking the bank is to incorporate more texture. Instead of solid items, you will want to add textures with divine details. 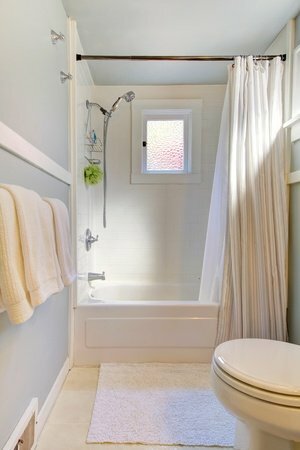 For example, you will want you can incorporate a textured bath rug or fringed towels to help add a little more depth. Mirrors are a big deal in any room, but especially in bathrooms. Be sure to make a statement with a unique mirror for your bathroom wall. If you want to stick to a budget, you can explore local thrift shops to find inspiration. 4. All in The Details. Do not forget to add decor pieces throughout your bathroom to add a little bit of a personal touch. Glass dishes for jewelry, decorative canisters for cotton swabs, and mason jars for your toothbrushes are examples of functional yet stylish decor pieces that you can include. When designing a bathroom, you want to pay attention to all of the little details. Do not let your hardware be overlooked. Be sure to replace outdated hardware with more stylish pieces. If your walls feel bare, you can incorporate artwork into the space. Simple pictures or artistic crafts can help add character without costing too much money. If you are searching for a little extra storage, floating wall shelves can do just the trick. Not only are they stylish, but they provide homeowners with extra space to store all of their bathroom essentials. When decorating any room in your home, you want to make sure that it transitions well from the rest of your home. For example, when you enter the bathroom from the hallway, do the rooms transition well into one another? If not, you will want to try to select a color scheme that is transitional and complimentary to your surrounding rooms. Be sure to check back weekly for more design tips and tricks. Thanks for reading! Amongst the most popular color choices is of course, gray. This neutral-toned color is the perfect transition shade for any space. Gray is a versatile color that works well with every other color out there. It helps to balance out the other colors to create perfect symmetry in your space. If you are looking for something clean and classic, creamy white is for you. Creamy white is not the purest form of white; therefore, it helps to add some warmth back into the room. It mixes well with tans and beiges to create the ultimate cozy oasis. Taupe is also another warm neutral choice for your bathroom. You can choose from light, medium or dark taupe for your space’s color scheme and each shade can create a warm, luxurious space. If you are a more colorful soul, pastel blue may be for you. Pastels have recently made their way back into homeowner’s hearts and we are struck by pastel blue for bathrooms. This dreamy color will help to brighten up your day as you get ready. It is perfect for homeowners looking for a little bit of color in their life. Go bold or go home, right? If you are bold at heart, you may want to consider using charcoal. Charcoal is a rich color that emphasizes luxury and power all in one shade. If you are feeling extra bold, you could use charcoal on your walls to make a powerful statement. Mixing two of the shades we already mentioned, gray and blue, you will get this beautiful color. This shade helps to add a little more color into the room than a neutral-tone will bring without being overly distracting. One of the most classic bathroom colors in history is seafoam green and it is making a clear comeback. Seafoam green is a unique color that embodies freshness and adds life to any space. If you are feeling fun, you may want to try seafoam green. After talking about creamy white, we want to be sure to mention that pure white is also a perfect choice for bathrooms. No other color can embody this clean and straight-cut look quite like pure white. If you are up for the clean challenge, we suggest pure white. Greige is a mixture of the two most popular neutral tones: gray + beige. Greige has recently taken the design industry by storm with its appealing and attractive look. We love greige in bathrooms because it has a mixture of cool and warm tones to help homeowners who may struggle with incorporating colors. To finish off our list, we love the color blush. Blush is a soft, lovable pink that works in nearly every bathroom. Try pairing blush with whites and gray to create the perfect space. Are you looking for quick and cost-effective bathroom updates that you can do in one day? Well, look no further! We have created a list of six effective and efficient ideas for the busy homeowner. Let us get started! Up In The Air. Floating shelf systems are a creative way to store or display your items. Plus, they do not take up any precious floor space. Floating shelf systems are perfect for homeowners who have a little extra wall space and a little more to store. Try this unique look above your toilet or even on your wall with pictures. On The Side. A way to make your bathroom instantly more luxurious is by adding a side table next to the bathtub. This works especially well if you own a large bathtub. The side table can hold a towel and a luffa or something more decorative like a photo or art piece. Lights On. Light fixtures can transform a space and they are relatively easy to switch. You may be surprised by how much a new light fixture brightens your space. Revamped. If your bathroom cabinets are looking dull, you can spruce them up with a fresh coat of paint. Once the paint has dried, you can replace the cabinet handles with a more modern piece of hardware. Also, be sure to update your toilet paper holder and towel bar. Divide & Conquer. The organization of bathroom is extremely important. To keep your bathroom clean and organized, add drawer organizers to separate your items. This will help create a tidy bathroom and plenty of storage. Artistic Touch. Your bathroom can be decorated like any other room in the home. You can add a gallery wall, sculptures, flowers, and rugs to your space. Just be sure that you do not add too many items and make the place feel “tight” or “overwhelming.” Try and keep it to a minimalistic approach and build your decor as you go. Having a budget does not mean you need to sacrifice style! For more budget-friendly design inspiration, check out our store! Like many of us today, we are concerned with toxic chemicals and their impact on our health. Often a surprise, our bathrooms can be full of toxins and not one of the cleanest rooms in the home. For starters, we have listed a few tips for going green and where better to start than our bathrooms! Fresh Air – If you are lucky enough to have a window in your bathroom, open it and let the fresh air flood the room. Add one or two houseplants to help filter the air. A few plants that do well in bathrooms are snake plants, ferns, ivy, and orchids. Not only do plants filter the air, they are aesthetically beautiful while adding positive energy to the room. Tubs & Showers – Avoid purchasing shower curtains and tub mats made from plastic that contain PVC, which can release carcinogenic phthalates. Choose items that are organic and natural such as cotton, linen, and bamboo. Tub mats and shower stools made from reclaimed teak wood are a perfect fit for going green. Teak wood is also known for resisting mold and mildew. 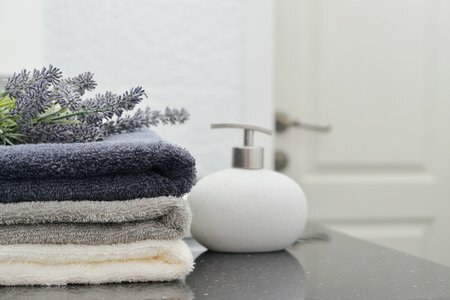 Towels – When purchasing towels, look for sustainable materials and organic cotton. Also, people that work in the industry of conventionally grown cotton are exposed to pesticides that can lead to health risks. Bath Tissues – Pay special attention to the contents of products you purchase. Regarding tissues and toilet paper, purchase products that are 100 percent recycled and are bleached without chlorine compounds. Many toilet paper cores are now made from 100 percent recycled materials. Toiletries – Stay away from products that contain petroleum-based scents and parabens that can cause allergic reactions in some people. Look for products made from plant-based ingredients. Also, many organic toiletries are packaged in dark colored glass containers (not plastic). Dark glass containers prevent the ingredients from being compromised by exposure to UV sunlight. Recycling glass is less expensive and easier than recycling plastic. We would love to hear from you about “greening” your home’s bathroom. This project is a wonderful way to include children while educating them about sustaining a green environment!